Love stories with the right feel and youthful content are the most successful in Telugu film industry. Many of the directors debuted with love stories and went on to become big names in the industry. We all know that Naga Chaitanya Akkineni and Samantha are married with love and they are coming together for the first time after their blissful marriage for a movie which revolves around a married couple. They are saying that this is the right movie for them to do. The songs and promos are already got applause for their feel-good content. This movie is directed by Siva Nirvana who earlier directed “Ninnu Kori” which was a blockbuster for its feel-good content. Let’s see how it works on us as it is releasing into theatres today. Poorna (Naga Chaitanya) is an aspiring cricketer who wants to play cricket in Indian Railways Team and he works hard to reach his goal. He accidentally comes across Anshu (Divyansha Kaushik) and falls in love with her. They both become one in their love and their destiny has another plan. Due to his bad company of friends in cricket, he loses Anshu and becomes single with alcoholic behavior. His single father (Rao Ramesh) feels and becomes sad for him as there is no one to look after him once he is dead and Sravani (Samantha Akkineni) comes into his life as his wife. Who is Sravani? What happened between Anshu and Poorna? How is the relationship of Poorna and Sravani turnout? Akkineni Naga Chaitanya has done a terrific job as Poorna. He looks convincing in both his youthful and elderly roles. He looks too good in his younger role. Samantha Akkineni is the one who steals the limelight with her fantastic performance as Sravani. She has given her best and this role would be her second best after Mahanati. Divyansha Kaushik is nice in her role as Anshu. Rao Ramesh is superb as the father of Poorna and Posani Krishna Murali is good. Chaibisket Suhas and Sudarshan are good as sidekicks of hero. All other actors are good in their given roles. The story of Majili is filled with love and the screenplay is written well. The dialogues are good. The songs composed by Gopi Sunder are nice. They are already in the playlists of youth. SS Thaman did fine work in composing background score. The cinematography is nice and editing could be better to make the film racy. Action department and art department has done nice work. The production values of Shine Screen are grand. 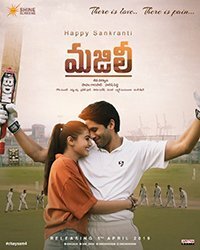 Majili is the story of a husband realizing the love and value of his wife after his heartbreak. The first half of the movie is okay with a few entertaining sequences. This half has some unnecessary moments and they could be chopped out. The second half of the movie where Samantha enters and the real movie what the audience expected movie starts. Towards the climax, it bores more and entertains in the climax. Director Siva Nirvana who did terrific work with Ninnu Kori has done a pretty average work with this movie. This movie purely runs on the performances of the actors and writing is pretty weak. The buzz that surrounds ChaiSam and the holidays would become boon for this movie which attracts families to theatres. If you expect to watch a film like Ninnu Kori, Majili might disappoint. To sum up, Majili is purely a movie to watch for ChaiSam and one should bear a few boring sequences to get the right feels.